Teeth whitening, also referred to as dental bleaching, helps you attain a brighter smile, improves your self-confidence, and gives a more youthful appearance. Discoloration begins in the late 20s and early 30s and a variety of factors can speed up the discoloration process including food and drinks such as coffee, tea, or red wine. Smoking is a big factor in making teeth appear yellowed and getting older can make teeth darker naturally. 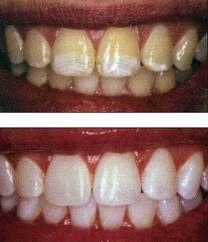 Some people have a genetic predisposition to early yellowing and staining caused by micro fractures in the teeth. Antibiotics can also cause discoloration. If you are self-conscious about the color of your teeth, professional cosmetic tooth whitening may be a procedure for you to consider.